Blue light has been a hot topic in the world of lighting for quite a while and today the conversation is popping up everywhere, from mainstream media to mobile app development. So what’s the big deal about blue light and why is it commanding our attention? Over the last few decades claims have been made about blue light and its affect on our physiology and psychology – such claims range from how blue light can impact our mood, productivity and alertness, all the way to it having the potential to fight anti-social behavior and even help prevent suicides. While some of these claims may have been exaggerated, and others may turn out to be completely un-substantiated, there’s no denying that blue light has an impact on us – a fact backed-up by the considerable amount of research that continues to be conducted. Before I go any further, let’s start at the beginning. Light is a form of radiation and what we perceive as different coloured light is simply different wavelengths, in what is only a small part of the wider electromagnetic spectrum. So why does this particular wavelength seem to have such a large impact on our body? 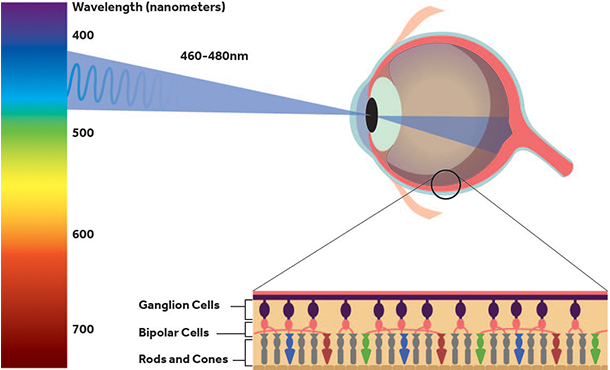 It’s been long understood that our visual system uses a series of receptors – rods and cones – and that these convert light into a series of electrical signals, which the brain uses to build an image of the world around us. Cones are responsible for our colour vision and there are three types: those sensitive to red, green and blue light, which, when combined, create our experience of colour. Rods, the fourth type of receptor, are responsible for low-level vision, but they don’t enable colour perception, which is why with limited light our vision becomes black and white. In 2001 a group of Neurologists from Jefferson Medical College in the US discovered a fifth receptor in the human eye, a receptor that’s non-visual but has a high sensitivity to blue light. It was found that this receptor is linked to the production of melatonin in the body, the hormone that regulates our circadian rhythms and causes us to sleep. Following the exposure to blue light, the eye’s fifth receptor triggers the body to respond by suppressing the production of melatonin. Melatonin is produced by the body’s pineal gland and when the quantity of light is low enough, it triggers the conversion of serotonin, the hormone responsible for making us feel awake and alert, into melatonin, which when released into the bloodstream causes us to feel sleepy. Since the link between blue light and our circadian rhythms has been understood it’s raised a key question: does the blue light component in artificial lighting support our circadian rhythms, or destroy the natural balance that the body needs to function correctly? The answer, as with a lot of things, is more about understanding what proportions are good for us and then how can it be used beneficially. A small amount of blue light in the evenings delivered from a phone screen, or a particularly bright cold white light, could set your sleeping patterns back by up to an hour. But the same amount of light delivered at midday would have no effect at all. This is why, as lighting designers, it’s important to factor into our design decisions not only the quantity of light, but also the quality and time of delivery. For artificial light to work in sync with our body it needs to adjust and adapt to the natural world around us, from which our sleeping patterns have evolved. This means that ideally the light needs to mimic the variation in intensity, colour and even angle of delivery. In the morning and evening artificial light should be lower in intensity with a reduced amount of blue, to replicate the orange and red hues of a sunrise and sunset. Ideally this light would also be provided by lower sources than those used during the day, to better simulate the way light from the sun, when low in the sky, reaches our eyes. During the peak of the day artificial lighting should again replicate that found outside: luminaires should be mounted at a high level, to mirror the midday sun’s angle of delivery, and they should have an increased amount of blue light. 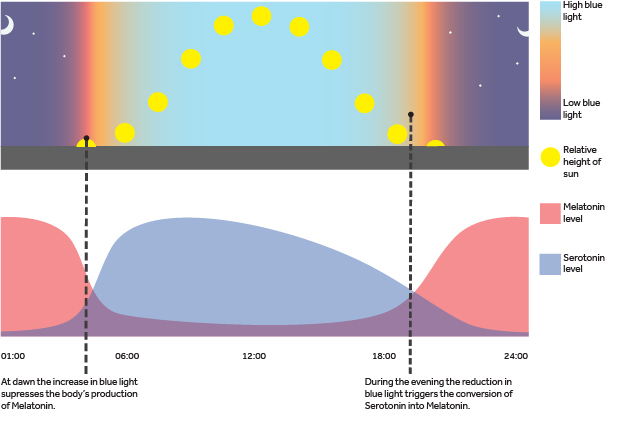 The International WELL Building Institute has started to include guidance on circadian lighting in its standards and how best to use it in the design of the built environment. The aim is to help adapt our workspaces to suit our health and wellbeing (although it could be said that these standards have yet to go far enough). The guidelines focus on the melanopic lux levels of a lighting scheme, to ensure that a sufficient level of blue light is present in order to support the body’s circadian rhythm. What this currently doesn’t take into account is the time of day the lighting is used and, as such, if used at the wrong times, it could have a negative impact that potentially outweighs the benefits. Designers and technologists have started to address how we approach this issue. In the last few years there’s been a rise in dim-to-warm technology and dynamic white light fixtures. These enable the creation of lighting systems that change throughout the day, and differ in colour temperature to better mimic the variation in natural light. LED manufacturer Soraa has even gone as far as creating a blue-less LED with the key blue wavelengths completely removed from the spectrum. The intention being that these could be used in areas where blue light could have a negative impact. But it’s not just the lighting industry that’s working on the issue. Today almost all smart phones and tablets come with a reduced blue light option for the evenings/ night-time, in an attempt to negate the adverse impact of their blue-rich displays. With all this considered, what is blue light when it comes to lighting design: is it an unnecessary optical pollution or is it a useful tool? When used correctly and at the right time, it can support the body’s natural rhythm, but when used poorly it can have a wide-reaching effect on physical and mental wellbeing. This being said, I wouldn’t rush into stripping out all the new lights you’ve just had installed at home, or go back to living in the dark. The key thing to consider is your daily exposure to light as a whole, both in terms of artificial light and natural light. For those who spend a decent portion of their waking hours in daylight, or in a nicely daylit office, the addition of circadian lighting systems will have very little impact. However, for those who suffer from seasonal affective disorder or SAD – a type of depression that’s linked to the winter months – circadian-linked lighting could potentially help alleviate symptoms and aid mental wellbeing. Where these systems are vital, in my opinion, is in areas where end users don’t have access to natural light throughout their daily routine – for example, shift workers. Also, in the likes of hospitals and care homes users may not regularly, if at all, have access to natural light and therefore experience long periods where their only source of light is artificial. This has been documented as having a negative effect on the body, not only on sleeping patterns, but also recovery times. An excessive imbalance in the body’s production of melatonin has even been linked with an increased risk of cancer. 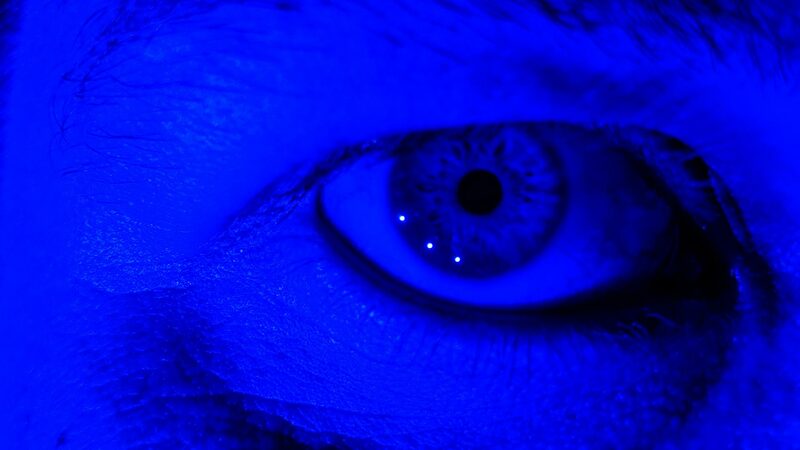 A recent study from the University of Toledo in the US also highlights that prolonged blue light exposure results in the degradation of the eye’s light receptors, increasing the rate of permanent cell damage within the eye, which speeds up the loss of sight. This highlights just how important it is to understand the way that blue light can affect our health and wellbeing, both from a positive and negative perspective, and why it requires some serious consideration. It also raises some moral questions about how and if designers and building owners should be modifying people’s circadian rhythms, whether to promote wellbeing or otherwise (this is a whole other topic of conversation…). As lighting designers, and when thinking about end users, it’s important to understand how the body responds to blue light – we need to factor this into our designs and the way we illuminate the world around us and interact with our environment and technology. A side effect of modern living is that we’re all constantly pushing our bodies out of their natural rhythms. And the fact that we’ve artificial lighting means that our waking hours have increased and impacted our natural sleep and wake cycle. For most of us blue light might not be something to be hugely concerned about, in the grand scheme of things, but it’s important that it’s always understood and considered when designing any lighting scheme. How will the proposed lighting affect the end user? Will this have a large impact on their daily exposure to light, and is it possible to utilise this in a way that ensures it has a positive effect on wellbeing rather than a detrimental one? On a final note, it’s always a good idea to dim the lights in the evening, lay off the tablet or smart phone, and let the body relax into sleep, rather than expecting it to respond at the flick of a light switch.